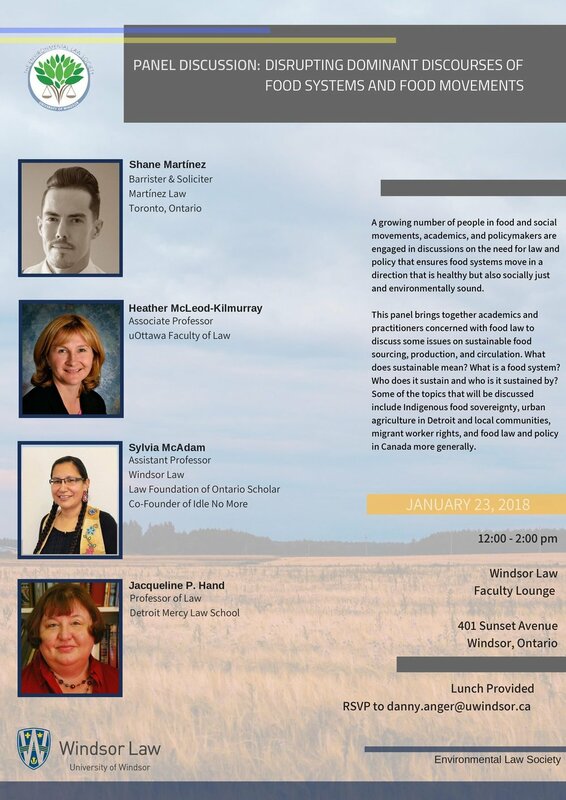 Professor Heather McLeod-Kilmurray will be part of a panel discussion on “Disrupting Dominant Discourses of Food Systems & Food Movements”, hosted by the University of Windsor Faculty of Law on January 23, 2019 from 12:00pm-2:00pm. This panel brings together academics and practitioners concerned with food law to discuss some issues on sustainable food sourcing, production, and circulation. What does sustainable mean? What is a food system? Who does it sustain and who is it sustained by? Some of the topics that will be discussed include Indigenous food sovereignty, urban agriculture in Detroit and local communities, migrant worker rights, and food law and policy in Canada more generally.